There is so much to do in the month of December. It can be a stressful month as we prepare for the holidays. But my advice to you is to take time to laugh at yourself and at others. Larry and I love to laugh. No matter what trials we have faced, we can’t stay blue for long. And that is a good thing. 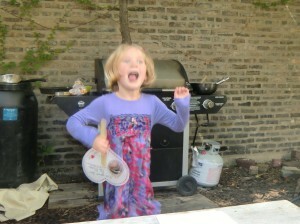 “Laughter is good medicine.” Physically, laughter triggers the release of endorphins that cause a sense of well-being. Studies have demonstrated that children laugh on average more than 300 times a day. We adults only laugh a dismal 15 times a day. No wonder grandparents enjoy being with their grandkids. Did you know that 85% of what we worry about never happens; and if the problem occurs, our excellent coping skills help us to manage successfully? Share a laughable moment on my website. I have a great one to tell you called Sweet Delusions. My best friend growing up was Adelina Gina Maria Sangineto. I clearly remember seeing her parents grasping her little hand as she stumbled behind them to register for elementary school. She had sparkling brown eyes, long black hair and an effervescent personality. She soon became my best friend. In high school, we studied geometry together at her house while listening to the background operatic music of Enrico Caruso. 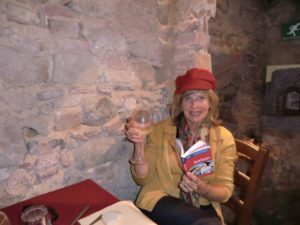 Her mother would share a small dish of magnificent food like mostaccioli, ravioli or lasagna—all so different from my bland American diet. Adelina would brag about her many trips to Italy where flirting included proposals and being pinched numerous times. I knew that someday I would visit this enchanting country of beauty, history, and culture. 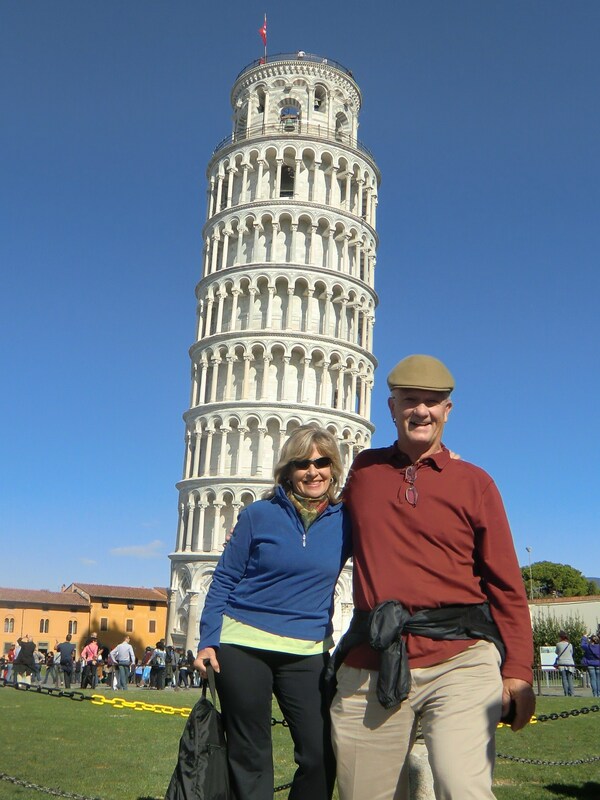 That dream became reality a few years ago when Larry and I traveled Space A—retired, military from Baltimore Airport to Aviano, Italy with our Military Living booklets, our Italian phrase book and Rick Steve’s list of recommendations in hand. We squeezed into a Fait—-a tight squeeze for my husband’s 6’2” frame. The car did not have a GPS system which forced us to study the maps more intensely and to meet more Italians who could help us with directions. The local roads use the rotary system and we ended up embracing them; when we were indecisive, we just went around a couple times before being ejected to the correct town. Our destination was Tuscany, where Camp Darby Army Base is located. For information concerning lodging see Darby Military Community Center Bldg 202/Tel: +39 050-54-7580/ DSN Tel: (314) 633-7580. There are several reasonable options for housing, a room, a suite or a summer cabin Our lodging was at the center of our daily excursions in central Italy. I’m sure there will also be wonderful Air B& B’s as well. We decided beforehand that when we got lost we’d make it an adventure rather than a time for a feud. We looked at it as an opportunity to interact with the locals and to see unexpected cities. Helpful Italians are everywhere. For instance, a father and daughter were washing their store windows when we approached them for directions. “Porfavore, Dove esta Sienna?” I said. The daughter knew English but did not know the directions. The father knew the directions but did not speak English. They became an exciting duo as the father explained with much gusto in Italian and the daughter erect like a soldier translated. The father was so animated that words were not necessary. 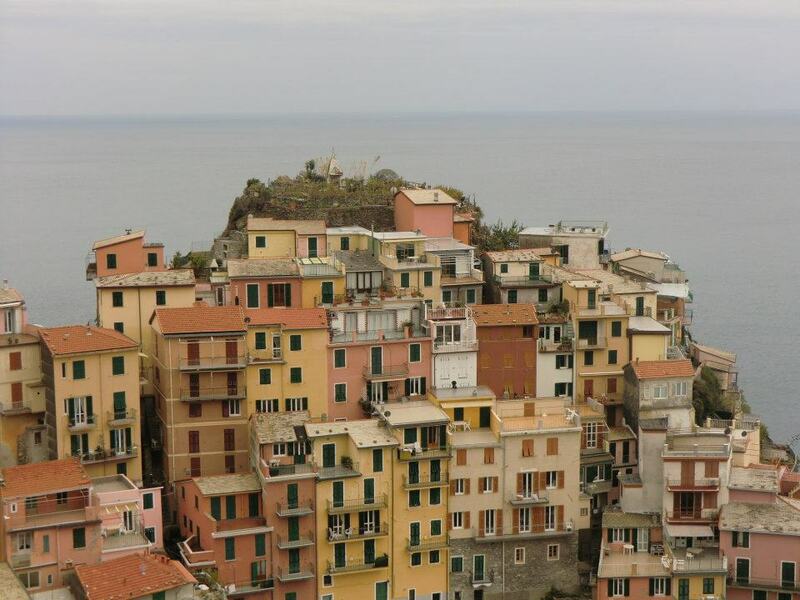 We often heard easy, straight ahead—but nothing in Italy was straight ahead. The locals referred to this area as FIPILI which stood for Florence, Pisa, and Livarno. 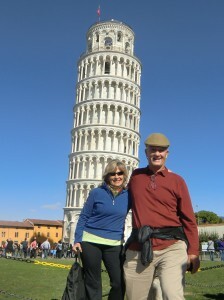 Our first adventure was to Pisa which is like visiting the United Nations. It is one of the seven man-made wonders of the world. The circular stairway was so narrow; Larry’s shoulders touched each side. Next, we visited Lucas—the birthplace of Puccini, the great composer, whose family member was to perform that evening. Lucas is one of the two cities in Italy with walls totally intake to protect them from neighboring ferocious Florence. On our way to Sienna in Tuscany, we took the back roads enjoying the country view of olive gardens and abandoned villas. We stopped in Volterra where we drove up a mountainside reaching a town, known for their alabaster wares, that took us back to medieval times. Our destination for lunch was a restaurant in a cellar resembling a catacomb named (La Vaverna della terra di mezzo/ Via Gramsci 64, 56048 Volterra (Pi)/ 0588-87394) www.dapina.it. We had soup, wine, and delicious bread. Another evening we had tasty ravioli while we sat outside under the star-filled skies.You cannot go wrong even if you are forced to eat at McDonald’s where the spinach bun melted in my mouth and the tiramisu was as smooth as silk. 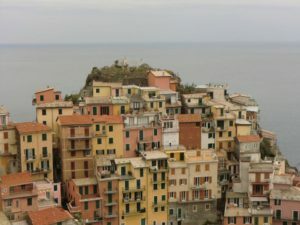 Next, we visited Cirque terra—-the Italian Rivera with five colorful towns cut into the mountainside. Soon we had our own hiking group—We were drawn like a magnet to anyone speaking English. We met a couple from New Zealand and another from Florida. While having lunch together we served as our own tour guides by sharing our knowledge of the area with one another. Our final destination was Florence—a place where fairy tales were created. We saw a cathedral constructed with three distinct colors of marble. But the highlight of the day was seeing the breath-taking statue of David, Michelangelo’s crowning achievement. His majestic height, rippling muscles, and strong expression brought many to tears. On a lighter side, Larry was drawn in by commercialism. He could see no reason why he shouldn’t purchase the pair of swimming trucks or apron featuring a graphic picture of David from the belly button to the knees. It was sad to say goodbye to Italy. We certainly hope to do another week in the future to Venice, Rome, and Naples. We found October to be a great time to travel to Italy—-tourist season is winding down and the weather is still pleasant. Be sure to include a trip to Italy on your bucket list, and do it economically by perhaps driving and forming your own tour group. You will meet wonderful people, eat delicious Italian cuisine and see unforgettable sights. Learning some Italian phrases, and bringing a Garmin and Rick Steve’s travel books will be very helpful. By the way, despite five proposals, my friend Adelina Gina Maria never married but instead devoted her life to her parents and her teaching career.